Get low cost VoIP calls on your smartphone. 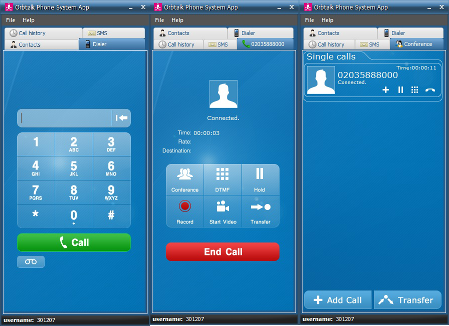 User friendly, easy to configure and compatible with most VoIP systems. The Android SIP Phone from Orbtalk is the ultimate mobile VoIP solution. Compatible with most VoIP phone systems in addition to the our Hosted PBX and SIP trunking solutions, this full featured app lets you take your desk phone in your pocket wherever you go. It fully integrates with your phone's contacts, allowing you to seamlessly switch between making VoIP calls and standard cellular calls. Our app is easily configurable. Users can be registered to any extension on the PBX so that they can answer calls. Also users can be registered to their SIP trunk. This is predominantly valuable for directors and sales staff, who may be appearing at business seminars and conferences on a regular basis. Transferring calls to other extensions is effortless from our SIP softphone. Users are able transfer calls they have received or placed using the application's call transfer feature. Please note that this will require being registered to a phone system that can process this transfer, for example, the Orbtalk Hosted PBX. Call transfer is a mechanism that allows a telephone call to be relocated to another destination. In an attended call transfer, a caller will be put on hold whilst the callee dials the new destination and agrees that the transfer will take place with a third party. Once agreed, the caller will be taken off hold and the actual transfer of the call will be performed. Our phone app supports standard industry codecs (including G711a, G711u, G729), this makes it fully compatible with our hosted PBX or a third-party PBX or SIP trunk. Utilise heightened audio quality via codecs such as G711u and G711a. A codec is a software component that can translate a digital stream from one format to another. For SIP phones, we are primarily dealing with audio codecs which offer a range of different compression options. The better the compression, the more bandwidth that can be saved. We're also extremely excited to provide a sneak preview for you here of a new product that we have in development. The concept is simple: we provide you with an industry standard SIM card for your mobile phone and you continue to make calls in the normal way. However the advantage is that once your call has been placed via the 3G network the rest of the call is routed via our SIP network. So what does this mean for you? It means you can make standard 3G calls, taking advantage of 3G masts and signal, but be billed as a VoIP call at VoIP prices! It really is a win-win scenario and we can't wait to offer this service to you. A subscriber identity module or subscriber identification module (SIM), is a small card with a chip on it that securely stores your international mobile subscriber identity (IMIS) and key. In simple terms, it stores the username and password required to make calls on a mobile network. Make a enquiry and pre-order today!